i checked every part of the house and found out that the greenest part of it is the mini garden right behind the living room. this tells me that we need to add more plants inside the house but thanks to my mom for keeping this area green. 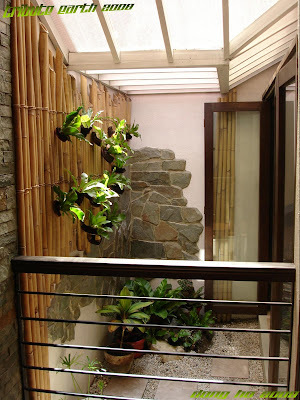 i'd love to have a green corner in my place n the mere future too... hehe..
it's always great to have plants around.that space called for a rock garden,idea lang. i need some updating here i miss last weekend be back later on. Cool dong pag madami nang plants behind your living room, ok mag chillax jan..
That's a beautiful garden. That's interesting architecture, too! dave, that would be great! maya, i like rock garden. paolo, sana nga dadami pa.
thanks sandy! my father designed it for my brother. That is very Japanese in style... almost zen! We should all have a green corner in our homes. hi sidney, yes i think the design is based on zen idea. hi dra. rio, my mom likes orchids too but maybe there's not enough space for that in this small garden. but she really likes orchids because our house in the province has varieties of orchids. seems like a cool place - literally and figuratively! Hvaing palants at home is indeed a breth of fresh air! I like your house's green area :) I'll add in a mini water fixture to it, add some fishes too :P weeee!!! Your mom maintained it well too. earvin, i agree with that. napaboaniya, that compliment will surely be relayed to my mom. thanks! we need a little sanity even inside our house and that is often provided to us by a green garden. okay yung rock garden nyo, it's as if it was really intended to be there. hi rayts, thanks. now i owe a lot from my mom. beng, thanks. keep in touch.